In their on-going tribute to what Tom Brokaw dubbed "the greatest generation," Steven Spielberg and Tom Hanks teamed up again to serve as executive producers on the critically acclaimed 2010 HBO miniseries The Pacific, which follows up their wildly popular 2001 HBO miniseries, Band of Brothers. Drawing on the memoirs of a few of the men involved, The Pacific tells the amazing story of the United States Marines Core's battle against the Japanese military, mainly through three individuals who served in different regiments of the 1st Marine Division: Medal of Honor recepient Gunnery Sergeant John Basilone (Jon Seda), Corporal Eugene Sledge (Joseph Mazzello), and Private First Class Robert Leckie (James Badge Dale). The Pacific begins shortly after Japan attacked the United States at Pearl Harbor, Hawaii on that infamous date December 7th, 1941 and covers approximately four years, ending just after the surrender of the Japanese and showing how some of the men reintegrated back home. Told over 10 episodes, the miniseries covers the battles at Guadalcanal, Cape Gloucester, Peleliu, Okinawa, and Iwo Jima. The sequences are intense and brutal, for both the characters and the viewers, who are immersed in the events and their aftermath, particularly those who have the benefit of the Blu-ray presentation. What's even more impressive are the stories told about the soliders away from battlefield. After receiving his Medal of Honor, Basilone was brought home to help sell the war, but he doesn't care much for this new role while the fighting continues. Leckie and Sledge are both shown suffering from different types of post-traumatic stress, and it's woefully clear no one knew how to properly treat them or the many others who were afflicted in the same way. The video is presented with a 1080p/MPEG-4 AVC encoded transfer at an aspect ratio of 1.78:1. Colors are strong. The greens and browns of the Pacific islands landscape dominate the visual palette with unfortunate bright splashes of red used often as a result of the fighting. The details are vivid, almost too much at times, such as during the aftermath of battles when fragments of body parts can be seen. The CGI looks realistic. For example, a scene between warring naval ships delivers very believable explosions when viewed in the distance by Marines and the viewer. The English DTS-HD Master Audio 5.1 Surround Sound is outstanding. Again, most notable are the battle sequences when the viewer will likely feel in the center of the action and likely use these segment to show off the system to friends. Effects pass throughout the channels, and the rears deliver a constant flow of activity. The soundtrack keeps the subwoofer active with a frequent barrage of bass to augment the explosions. Extras on the five discs with episodes are Historical Prologues (HD) where Hanks and others offer historical context; Enhanced Viewing, a Picture-in-Picture feature, which contains interviews with historians and veterans, as well as archival footage, and maps; and the Field Guide, an interactive feature that offers a great deal of information by way of Maps, Marines' Experience, Historical Overview, and Facts and Bios. 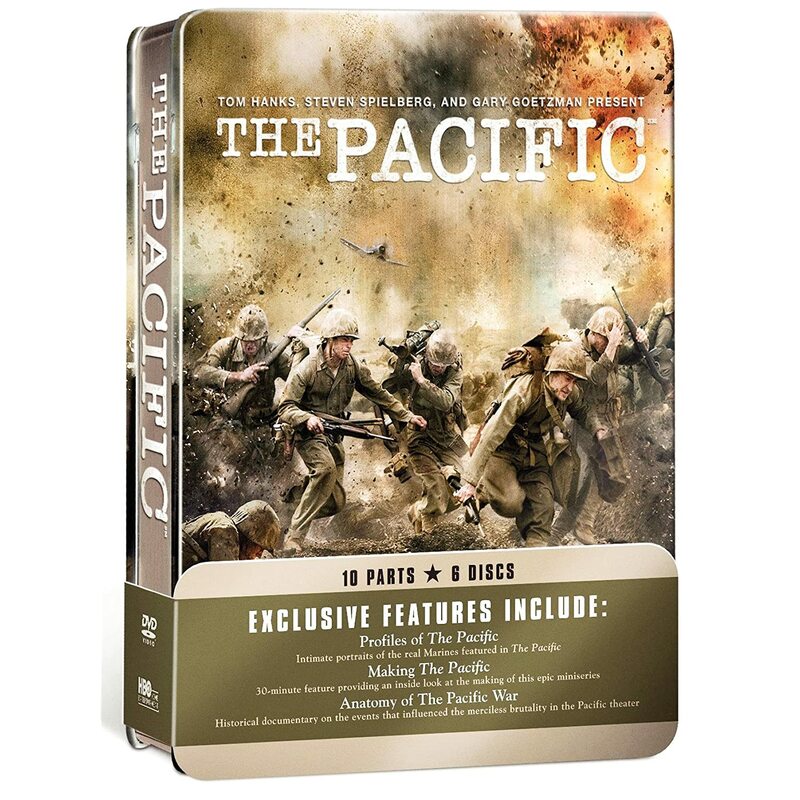 The extras on Disc Six are Profiles of The Pacific (HD, 48 min), a feature that looks at the real men from the miniseries as talked about by people who knew them; Making The Pacific (HD, 23 min) is a behind-the-scenes look at the entire miniseries; and Anatomy of the Pacific War (HD, 10 min) brings together people offering information about the Japanese military of the time. The Pacific is an impressive production of a rare scope in television and it's no surprise it has been awarded so many accolades from critics and peers. The men whose stories are told are very deserving of the recognition, and the Blu-ray edition presents an excellent audio-visual experience. Got the (non Blu-Ray) set for Christmas. About half way throgh now. Really enjoying it, but it feels much more disjointed than Band of Brothers did. It does have odd pacing, as the three storylines get varying degrees of attention, especially towards the end.